Are you looking for a safe line of baby care products? Look no further than MD Moms Babysilk products. MD Mom's skincare line is clinically tested, hypoallergenic, naturally based, gentle and effective! The products were developed by moms who also happen to be pediatricians. All their stuff is great! One product I would like to highlight is perfect for the summer-Babysafe Sunscreen Towelettes. They make putting on sunscreen so easy! All you do is take one and wipe it over your child-no sprays, no smearing. It is especially easy to put on in the facial area and you don't have to worry about getting it into their eyes because you control exactly where it goes. 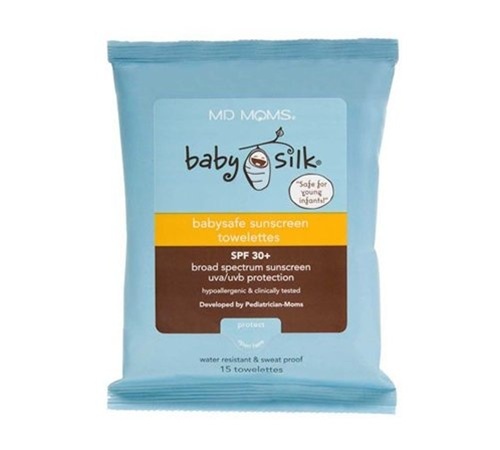 These award-winning soft wipes are saturated with a gentle, sweat-proof, broad spectrum SPF 30+ sunscreen that’s enriched with Vitamins E and B5, marine silk, aloe and oat, to protect, soothe and moisturize even the youngest baby’s skin. Each wipe contains enough sunscreen to cover baby from head to toe, with no fuss and no mess. They’re a dermatologist-approved way to keep baby protected from UV rays at any age, anywhere, anytime. Another products that is great is their Soothing Bottom Relief Diaper Rash Cream. Not only does a little go a long way but it is also cloth diaper safe! This lightweight lotion smoothes on white, then turns clear to provide an invisible moisture barrier and to protect, soothe, heal and moisturize all-in-one. Based on an innovative “liquid glove” formulation, a blend of marine silk, Vitamins E and B5, zinc oxide, aloe, licorice, shea butter, ginger root extract, chamomile and a natural antibacterial agent protects baby’s skin against irritants from dirty diapers – leaving baby’s bottom clean and dry all day! Overall, their products are really great and we have been getting a great response from our customers! Hello, I love reading through your blog, I wanted to leave a little comment to support you and wish you a good continuation. Wish you best of luck for all your best efforts. Hospital furniture in Delhi, Baby care products.